It just make you feel so great when people like what you are doing and appreciate the work of your hand . I have a friend who love my cake and place an order for someone birthday celebration . Not too sure what exactly they will love , is always best to use the ingredient that is fresh or in the season. Yes is winter in Australia. How different is it when we have winter in the middle of year and the rest is summer hot hot . Since is winter we will have all the great berry fruits . I asked my friend what fruit she preferred , strawberry or blueberry. She choose strawberry as her daughter love that fruit. I always touch by the heart of a mother, as I knew blueberry is my friend's favourite. 1. Put water in a bowl , sprinkle gelatin on top . Let it bloom and heat up in microwave for 30sc or let it sit in a bowl of hot water to dissolve the gelatin. 2. Beat the pouring cream with hand held mixer in a cold metal bowl till soft peak. 3. Fold in the whipping cream in the strawberry yogurt ,combine it well.Sprinkle the gelatin in and incorporate it well to the yogurt cream mixture. 1. 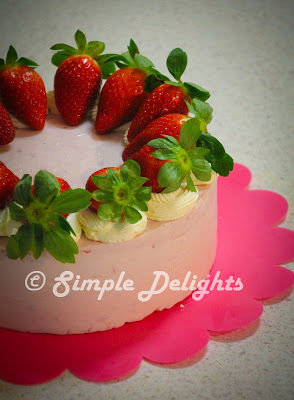 Place one piece of the sponge cake in the 7" spring foam cake mold. 2. Pour in 1/3 of the yogurt mixture in . Smooth the surface. 3. Place second piece of sponge cake on top of the yogurt mixture. 4. Pour in another 1/3 of the yogurt mixture in smooth the surface. 5. Place the last piece of sponge cake on the top of the yogurt mixture . 6. Pour in all the yogurt mixture and smooth the surface well . As this will be the top of your cake. Let it chill in fridge at least 4 hours or overnight. Carefully dislocate the cake from the springfoam mold . 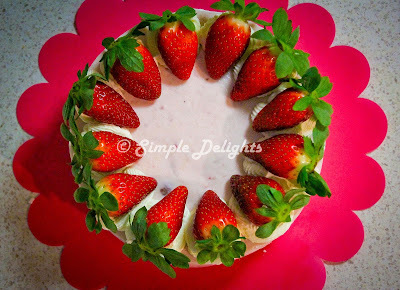 And decorate with strawberry on top. I have asked my friend to take a picture of the cake and see how was the cake like . The picture is not very clear as was taken outside . But the layer is quite to my satisfaction . All the girls love the cake and I would say this cake is definitely healthy is YOGURT !!! It just make you feel good to have some dairy in your dessert. 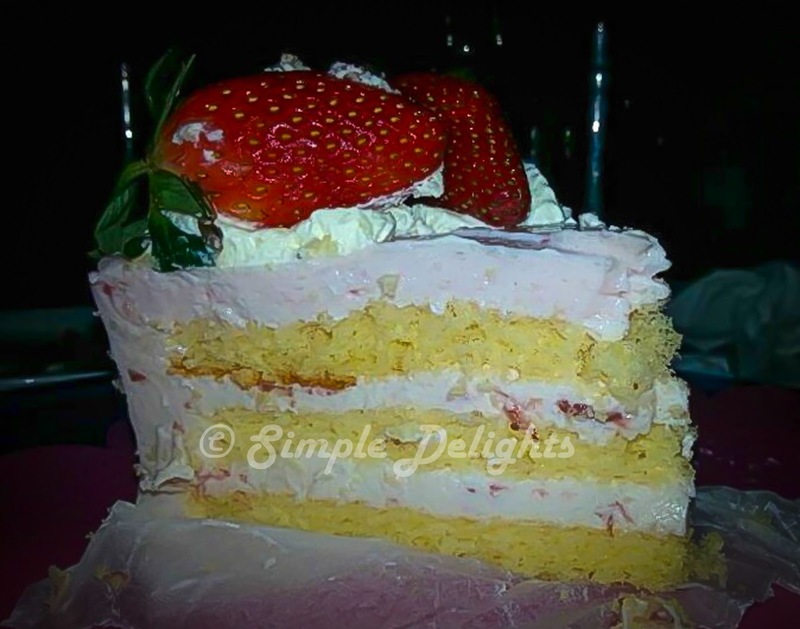 Try it out yourself , your friend will sure enjoy this cake as much as you do .